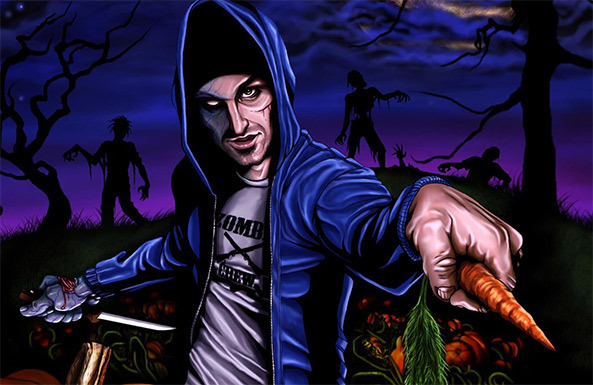 Back in March we learned that the minds behind “The Vegan Zombie”, an online vegan cooking show where the only way to survive the zombie apocalypse is to stay clear of meat and dairy, are creating a graphic novel/cookbook combo. And, they are fundraising on Kickstarter to get the financing to make the book happen. You can tell the horror loving vegans are already on top of this one, because while the campaign still has 22 days to go, they have already raised $17,472 of their $18,500 goal. While, of course, there will be recipes galore including favorites from the cooking show and 10-15 brand new recipes, what makes this project unique is that there will be a story included throughout that follows the adventures of the vegan host as he fights against the zombies and stays zombie free by cooking and eating delicious vegan foods. Samples of recipes that will be in the book include corn dogs, creamy kale salad, no killy philly, tofu scramble, spicy black bean burgers, raw blueberry cheesecake, peanut butter cookies and so much more. We think part of the reason their Kickstarter is so successful, beyond the awesome concept, rabid fanbase, and scrumptious recipes, is that their rewards are fantastic. For $5 you can get the digital download of the e-book. For $25, you get a printed copy of the physical book. Of course there are more perks like signed books and tote bags, but we love the fact that the digital copy and physical book are so affordable. It really is just pre-buying the book. It’s no wonder 484 people have backed it already. Check out their pitch video below and their Kickstarter page for more.